It was a great day in the recent history of IRI when H.E. Mamnoon Hussain President of Islamic Republic of Pakistan inaugurated Gosha-e-Iqbal in Historical Gallery of the Institute. The President took keen interest in the very rare displayed photographs of Allama Muhammad Iqbal and appreciated this effort. On the occasion, Dr. Muhammad Zia ur Haq Director IRI briefed the President of Pakistan about the establishment of this corner. 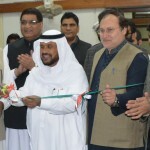 He stated that institutes like Islamic Research Institute are according to the desire and dreams of Allama Muhammad Iqbal to educate the coming generations and youth of Pakistan about the ideology of Allama Iqbal; this is honor to establish Gosha-e-Iqbal at IRI. 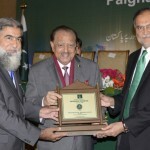 Dr. Muhammad Zia-ul-Haq also briefed the Mamnoon Hussain the Historical Gallery of IRI was established in April 2015, which was inaugurated by Senator Raja Zafar-ul-Haq, the Leader of House in Senate. 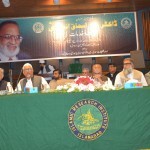 Mufti Muhammad Rafi Usmani of Dar ul Uloom, Karachi, Dr. Masoom Yasinzai Rector IIUI, Dr. Ahmed Yousif Al-Driaweesh President IIUI and Dr. Muhammad Zia ul Haq Director IRI.